No Fenders -Formula 1, IndyCar and A Whole lot more..: Mansell ‘N Schuey? Yet after I’m certain that a much younger Nico Rosberg had signed on the dotted line for what he inherently thought would be “His Team,” apparently Ross Brawn, Norbert Haag ‘N Co. lured DER TERMINATOR back into the fold... As Michael has apparently been itching to return to The Pinnacle of Motorsport and finally found the right “Deal” after having had his Scuderia Dreams Scuttled by his injured neck from some “Scooter” accident, previously suffered while trying to keep himself occupied. Ironically, Michael is trying to make his F1 comeback at the age of 41yrs old, and while I’m certainly NOT trying to make ANY comparisons to ‘Il Lione or ‘BLOODY NIGE! Nee Nigel Mansell... It was Fifteen years ago that the 41yr old (coincidence?) 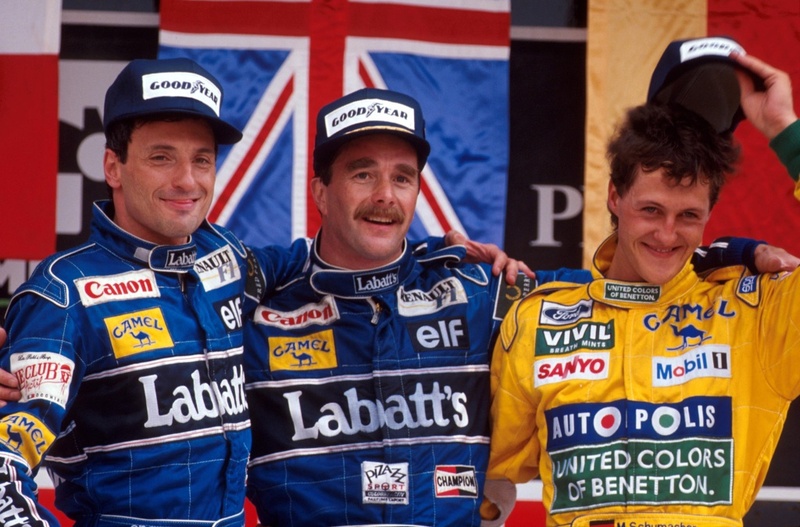 Briton had his last gasp in Formula One, making a very disheartening final two starts for McLaren... Before walking away from the sport, claiming the MP4-10 Mercedes Benz wasn’t any good... 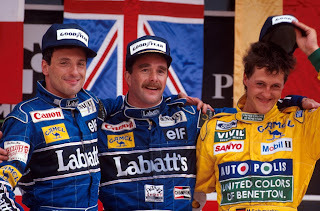 While many including myself spent years making fun of ‘Ol Nige’s backsides being Too large... As originally Mansell couldn’t fit the McLaren’s too narrow cockpit and thus Mark Blundell substituted for Nige in the season’s first two races before replacing Nigel for good at the Monaco GP. And while Michael Schumacher has been outscored 4-0 in the ever important intrateam competition, as in Rosberg has both Out qualified & Raced him 4-0 to date and is second in the Drivers Title fight with 50 points vs. Schuey’s 10... Are we simply getting ahead of our self’s here? As in Michael’s been out of racing for 3yrs which is an eternity in F1 standards and thus the sports never ending Technology advances have simply passed him by... While not to mention, who’d have ever thought the German would become the sport’s Elder Statesman? As much of his opposition is half as old as Michael, who may now simply be worried about his Family life more then making the ultimate sacrifice, eh? So do you think Schumacher will see out his three year contract or simply walk away in disappointment?